Immediately after war was declared in September 1939, he joined what would become the 2nd New Zealand Divisional Cavalry. He went into camp at Hopu Hopu, near Ngaruawahia in the Waikato, along with members of the 4th Waikato Mounted Rifles and new volunteers. They lived in bell-shaped tents from the First World War era, trained hard, and made lifetime friendships. Off duty, they relaxed under the camp's eucalyptus trees, which can still be seen today. In a few short weeks, Ian completed basic training at the camp (which is now the home of the Waikato-Tainui tribe, or iwi). He attended a farewell parade in Auckland, travelled by train to Wellington, and departed New Zealand with the First Echelon of the 2nd New Zealand Expeditionary Force (2nd NZEF) in January 1940. The destination was Maadi Camp in Egypt. He never returned. Ian saw action in Greece and North Africa and was wounded on the third day of the Battle of El Alamein, in the Egyptian desert, on 26 October 1942. He died of wounds a week later in Cairo, nursed by General Wavell's daughter. His service as a soldier, and the memory of all who served in the DivCav, are the inspiration behind this endeavour. The project is starting with one person, and a small core group of historians and enthusiasts, scattered all over the world. Like you, we all know someone who served in the DivCav or with the DivCav from other New Zealand regiments, battalions and units. Together, we are working to make this place a tribute to their memory. We invite you to join us to help make it happen. As we move forward, we will share more details -- but we need your thoughts and observations now. Your ideas will help shape what happens here and make sure that we do everything we possibly can, in the best possible way, to build a unique historical resource, one that is engaging and informative for everyone. Thank you for reading about us. We look forward to hearing from you. My name is Ian Latham, and I was named after my uncle (above). I'm a New Zealander, born 1949 in Matamata. I had a 30-year career in advertising, working around the world with the global agency, Ogilvy & Mather. Today, I have a brand strategy consulting business in Atlanta. I serve as New Zealand Honorary Consul in Georgia, Alabama, Tennessee and South Carolina, reporting to the New Zealand Embassy in Washington, D.C., and was Team Attaché for the New Zealand Olympic Team in Atlanta 1996. Two years before, I co-founded the New Zealand Olympic Host Committee in Atlanta, which raised funds for New Zealand Olympics, welcomed athletes and officials to the Centennial Olympic Games, hosted athlete families during the games, and managed the team's official headquarters, New Zealand House, in downtown Atlanta. That organization became the New Zealand American Association, which is today the social centre for Kiwis and all friends of New Zealand in Atlanta. As a writer and amateur historian, I am a member of the New Zealand Military Historical Society, which is passionate about our military history in all its forms, and the North American Vexillological Association, which studies flags. 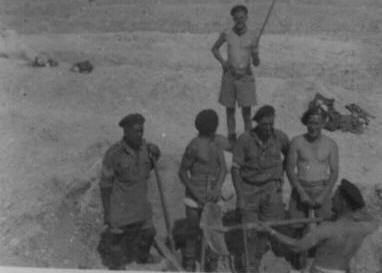 Ian Latham (lower right) digging a gravel trench, while the Divisional Cavalry was training with 2nd NZEF in Syria, 1942. Private collection.